In January 2016, we conducted a public opinion survey in cooperation with Parsifal SC d.o.o., to assess the attitude of the general public living in the target area towards nature conservation, preservation of the biotic diversity, and how informed they are on the project. In November 2018, the public opinion survey was repeated. The aim was to determine the success of the implementation of the communication/awareness raising activities of the project, and to check how the local communities perceive the benefits of the project. Key findings of the survey are presented below, full report is available “hyperlink” here. Majority (91.5 %) of the respondents feel nature preservation and keeping the nature intact is important (in 2016 this share was 93.3 %). Majority (75.2 %) of the respondents feel it’s important to them, that society allocates resources for preservation of animal and plant species and their habitats (in 2016 this share was 75.8 %). More than half (56.7 %) of the respondents is familiar with the meaning of the term Natura 2000 (in 2016 this share was 61 %; Slovenian average is 29 %, EU average is 10 %). More than half (52.3 %) of the respondents consider Natura 2000 to be an opportunity for development, while almost a third (29.2 %) feel it only brings restrictions and limitations. The rest are undetermined (in 2016 those shares was 54 % and 31.7 %). Respondents’ awareness of the fact that they live in the Natura 2000 area is high (80.5 %) (in 2016 this share was 71.7 %). 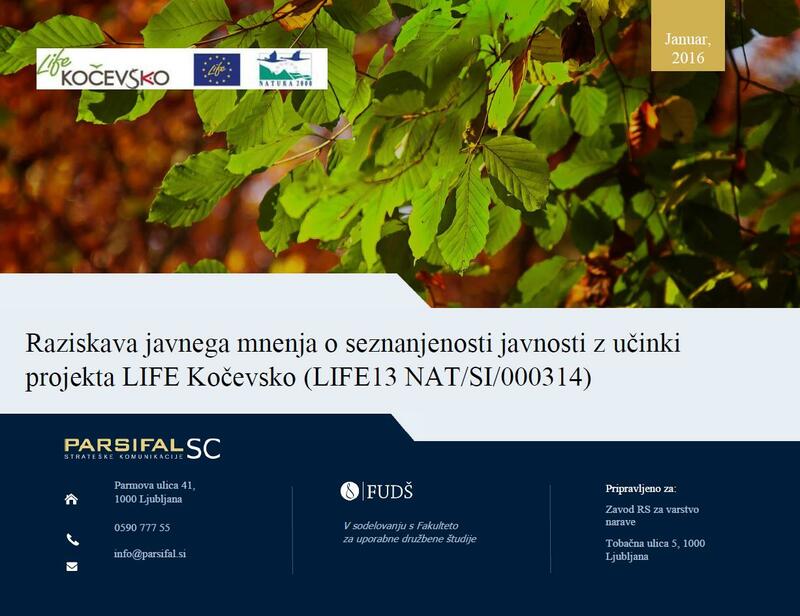 Majority (84.6 %) of respondents had no positive or negative experiences related to living in the Natura 2000 area, while 12 % reported having negative and 3.4 % positive experiences (in 2016 those shares were 78.1 %, 11.8 % and 10.1 %). Individuals who reported having either negative or positive experiences were given follow up questions on the experiences. The most common positive experiences of living in the Natura 2000 area, reported by respondents were preservation of nature, animal protection and clean water. Most common negative experiences reported by the respondents were construction limitations, poor accessibility, lack of roads, heightened risk of bear encounters, limiting economic activity in the region. 40.5 % of the respondents have heard of the LIFE Kočevsko project (in 2016 this share was 22.2 %). Respondents who have heard of it, mainly heard about it on the radio (30.3 %), read about it in national or regional printed media (26.7 %), heard it from family, friends and acquaintances (22.1 %), on television (21.1 %), on the internet (17.6 %) and from public presentations (8 %). Majority of the respondents (93.4 %) did not attend a lecture or participate in the project activities related to nature in the Kočevska region. The exhibition of the pictures selected in the KOČEVSKO – COEXISTANCE WITH NATURE photo competition in the Primary School “Zbora odposlancev” in Kočevje.